I had spent most of my early adult years in customer service and hotel management – while dabbling in running here and there. While pregnant with my second child, I decided to pursue my long time interest in the health care field, in Medical Assisting. After graduating, I worked in the Endocrinology Department at the Hospital of Central Connecticut and helped out after hours in the Metabolic Weigh Your Options Program. 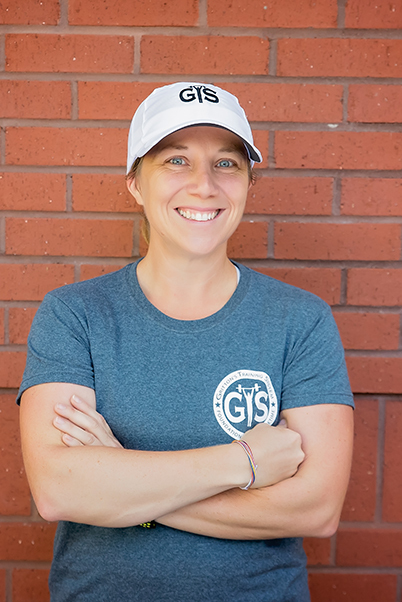 Once our family settled into Peachtree City, my dear friend, Jodi, introduced me to GTS where I became a client in a short term program. That was in 2015, and since then I have lost over 50lbs and had a complete change in my lifestyle! I wanted to use my experiences and health care background to help others, which lead to my ACE Health Coach Certification. Just start! It’s true – it’s all you have to do. Start with a small goal – something that is realistic and attainable. Start talking to your friends and family about your goal and ask them to help keep you accountable. Start moving – even if it begins with parking far from the door when you go grocery shopping. Start again if you experience any setbacks! Start believing in yourself. My typical training week includes 3 days of Strength training, 3 days of running and two days of yoga with GTS’s own, Jodi Fritz. I use Spark and Catalyst every day, but my new favourite has to be the Rehydrate Berry Lemon Ice! YUM!